Moon Marine is a full service boat dealer ready to address all your boating needs. Our customer's confidence is reflected in our high customer service rating. Join the fun of a boating lifestyle with Moon Marine. Whether you are looking to fish, ski, take the family out, or just cruise, we have a boat for you! We carry Crest Pontoon boats, Princecraft Pontoons and Deckboats, Larson FX Fishing boats and now Starcraft Fishing! If you are looking for an upgrade, we take trade-ins in addition to offering in-store financing. We equip these boats with both Mercury and Yamaha outboard engines. Already have a boat, but need service? We look forward to helping you and getting you back out on the water. Visit our showroom in Fond du Lac, WI or online. Pontoon refurbishing From complete restoration to just a little sprucing up, we can do carpeting, flooring, tops, furniture, motors or any of your pontoon repair needs. FACEBOOK AND INSTAGRAM We are on Facebook - LIKE our page!! Follow us on Instagram at moonmarineboats. The new 2019's are arriving! We are getting the affordable luxury, beautiful new Crest pontoons, the great PrinceCraft pontoons and Larson FX fishing boats. We are pleased to announce the addition of aluminum fishing boat from StarCraft! We have some great deals on the 2018's still in our showroom on all models. 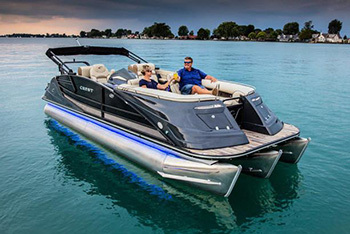 Check the inventory for available boats and pricing. ALL prices include freight and set up. No hidden fees. Check out our great inventory of new and used boats!